I first went to Mesclun last year, and was very much impressed with the dishes that Chef Katrina Alcantara has whipped up. After starting at the Linden Suites, Mesclun expanded to Serendra (which was the branch I visited), and now, their newest branch at Eastwood. Last week, I was invited to try their newest items of their menu.. I was really looking forward to what Chef Katrina had up her sleeves this time, but deep down, I honestly had no idea how she could top her earlier dishes. Then she brought out a Japanese A5 Wagyu Sirloin Steak. Before we got busy with the Steak, let me show you some of the items that I feasted on at Mesclun, both new and old. then sprinkled with a bit of Himalayan salt, and served with sourdough mini baguettes. The first savory appetizer they brought out were the Buffalo Balls (P315). Ground Chicken balls, coated in a spicy buffalo sauce that is tempered by the smooth, yet lightly pungent blue cheese dressing. A little bit too spicy for me, but I couldn't but taking one bite after another. During my first visit to Mesclun, I was able to try their Sisig Spaghetti. This time, Chef Katrina brought out the Clam Vodka Pasta (P395). I was hesitant at first to try it because I don't eat clams and tomatoes, not to mention I don't drink Vodka. But I was pleasantly surprised to discover that it really didn't taste all that much like liquor at all, and was indeed quite tasty. The Vodka was reduced down, and mixed into the tomato cream sauce, further enhancing its flavor. 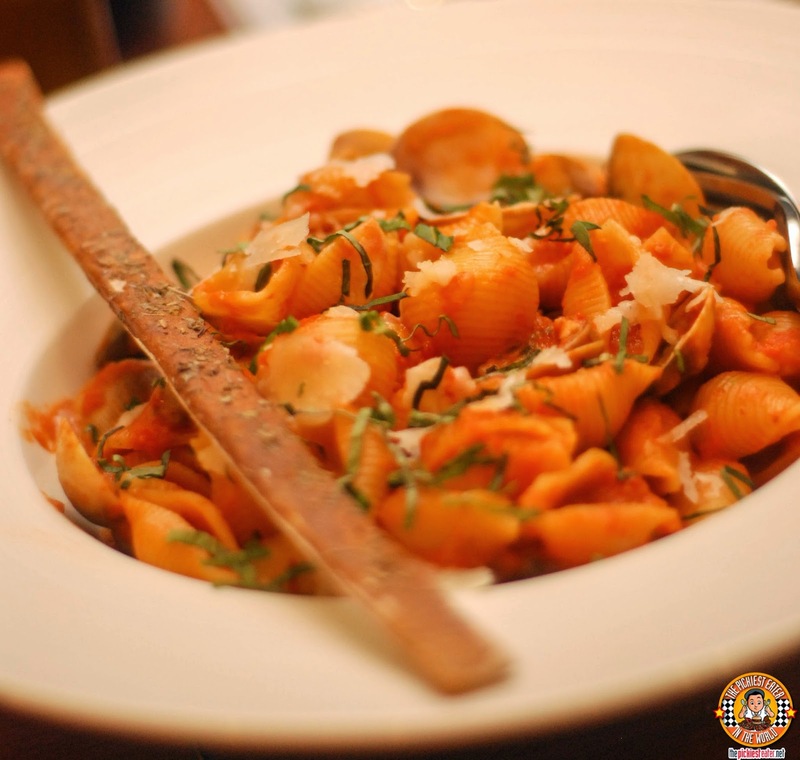 The sauce is then tossed together with the Conchiglie (Sea Shell Pasta), Manila clams, vodka tomato cream sauce. 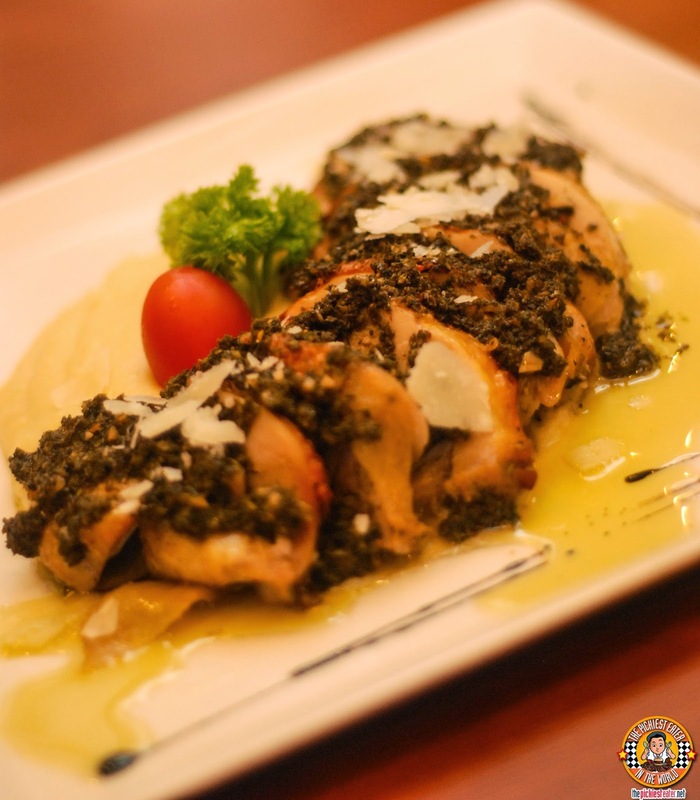 Next up was the Chimichurri Chicken (P345), which was a Roasted Boneless Chicken, drizzled in a flavorful Chimichurri Sauce, then topped with shaved Grana Padano, and served with your choice of Rice Pilaf or Mashed Potatoes. The cook on the chicken was perfect, and went wonderfully with the Chimichurri sauce. At first glance, the I believed the Wild Ulang Thermidor (P795) to be something straight out of Starship Troopers. Since the Ulang is a member of the shrimp family, I knew Rina would be kicking herself for missing this. 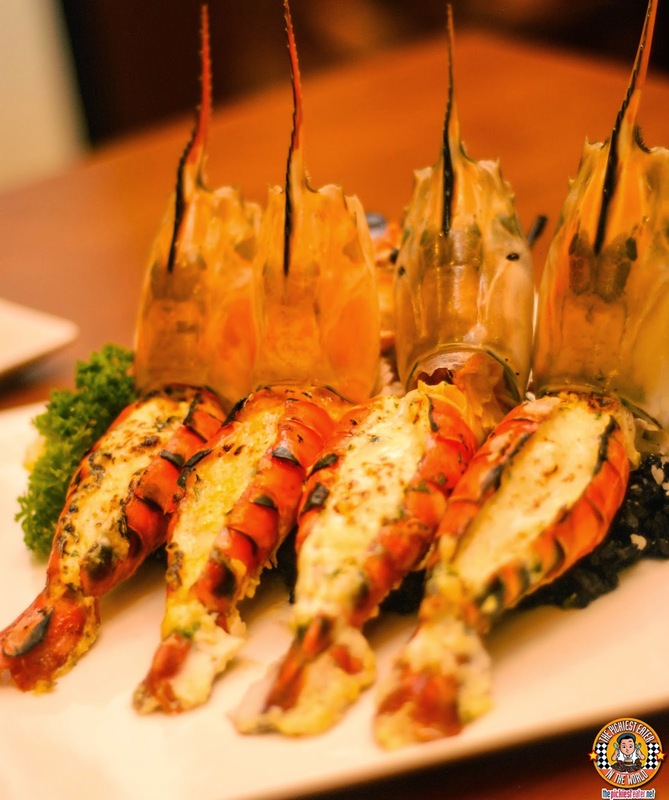 The Wild Ulang is filled with a creamy thermidor mixture, and topped with melted Grana Padano cheese. The four plump Wild ulangs are then laid on a bed of Black Ink Seafood Risotto. I'm really not much of a seafood guy, so my body was craving for a some meat. Chef Katrina obliged in a big way.. By bringing out the Crispy Pata Confit. 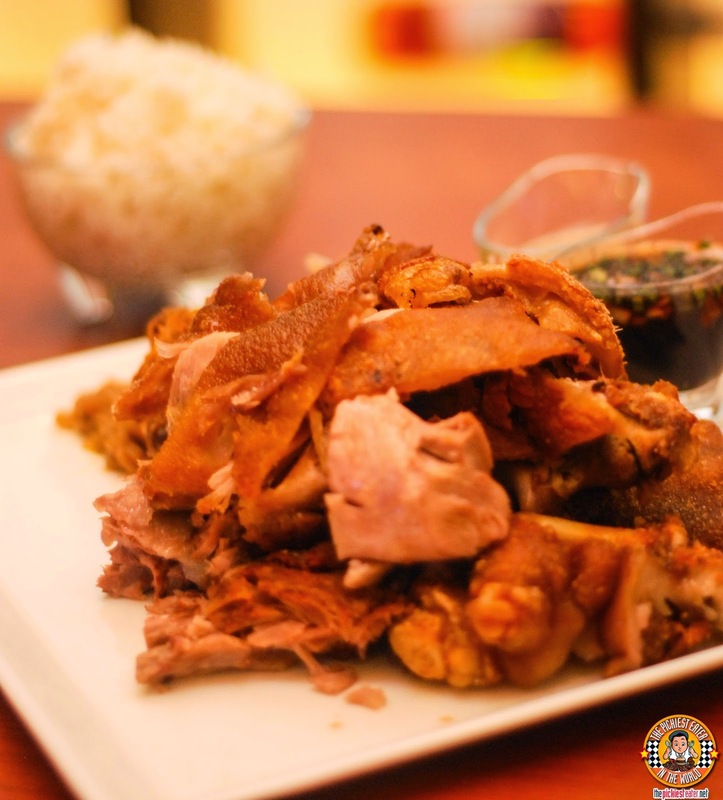 Given that it's a deep fried Pigs knuckle, the Crispy Pata is considered among the most decadent of the Pinoy dishes. So imagine how much more awesome it is when it is fried in duck fat? That loud crack it makes when you bite into the skin, down to the tenderness of the meat that has an added layer of flavor, even the thin layer of fat that seems to just melt in your mouth, makes this a dish that you must not miss when at Mesclun. Oh and guess what? The rice? Yup, that's Duck Fat Rice. The newest Big Daddy of Mesclun's Menu is the Japanese A5 Wagyu Sirloin Steak (P2,990). I had just come from an excellent Steak Meal a week ago, so I didn't think I would be impressed by this. And my mind was blown..
First of all, I was pleasantly surprised with the amount of fat that the steak contained. I don't usually associate "Striploin" with "fat". The cut was a bit thinner than I am used to, but I actually preferred it this way. The criss cross char marks, were beautifully embedded into the exterior of the meat, whilst keeping the inside at a beautiful medium. The A5 Wagyu is among the softest piece of meat that I had ever put into my mouth, and undoubtedly one of the best tasting as well. Mesclun says that this is good for 2 people, but I honestly feel that I can take down this bad boy all by myself. Not because the portion is small, but because it's really THAT GOOD. The meat is so flavorful, it almost renders the Sesame and Soy Dipping sauces that it comes with, totally unnecessary. What you CAN NOT MISS, however, is the Steak Fried Rice, which I could eat alone if I needs be. The rice is fried in steak fat, giving it an innate smokey, savory flavor, perfectly pairing with your Striploin. I was unfortunately unable to try Mesclun's "Sanlamig" dessert selections, but I made up for it by gorging on their newer desserts. The first was the Strawberry Shortcake (P375). Three delicious layers of butter cake is filled with strawberry cream in between, which include slices of fresh strawberries. What's nice about this cake is that the ends are not covered in frosting, which may very well have caused it to become too sweet. Mesclun's Cheesecake is also among the best I've had. The Cream Cheese frosting is the perfect balance of tart and sweet, and the carrot cake itself was wonderfully moist, effectively helping me reach my vegetable quota for the day. The Japanese a5 Wagyu Sirloin Steak is a great addition to Mesclun's already stellar menu, definitely making the holidays even more special! 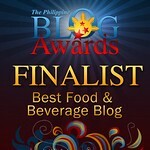 It's only out for a limited time at Mesclun's Serendra and Eastwood Branch, so I would go as soon as possible!. I want that raclette, burratina and that Wild Ulang Thermidor! It was all pretty amazing!! I'm obsessed with Mesclun's food. Damn that new steak!! I need to try that!! KRISPY KREME MAKES MAGIC HAPPEN THIS CHRISTMAS! VILLAGE TAVERN: TEX-MEX MENU & MORE! IT'S SWISS WEEK AT EDSA SHANGRI-LA! THE MCGRIDDLES ARE NOW IN THE PHILIPPINES! BAMBA: SHAKING UP DINING AT THE SOUTH!